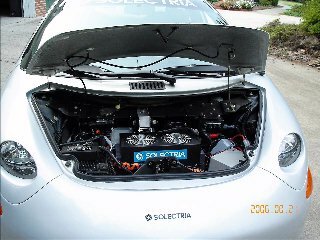 Solectria was a company committed to building electric vehicles that would change the world. Founder and CEO James Worden and his cars regularly won the annual American Tour de Sol race for electric vehicles. Beginning in 1988 with components for solar raycers, the company advanced to EV conversions, and finally the Solectria Sunrise, the most efficient and advanced electric vehicle to date. The goal was to partner with a major automaker to produce the Sunrise, much like General Motors had done with Aerovironment to produce their EV1. But, it was not to be. Just as the Sunrise was nearing completion, California backed down on its ZEV mandate. Freed of the need to build EVs, the automakers rushed to recall and crush their prototype EVs, and cancelled all further EV development. With no hope of finding a customer for their Sunrise, Solectria sold its electric vehicle component business to Azure Dynamics Inc. (now out of business), and continued as Solectria Renewables to produce grid-tied inverters and other renewable energy products. In 2005, James Worden put the remaining unassembled Sunrise parts, molds, and documentation up for sale. The Sunrise EV2 Project team was formed to pool our resources and purchase these parts and rescue the Sunrise from oblivion. 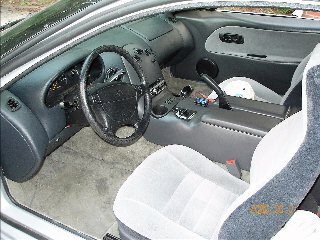 We have been working ever since to find a way to make this remarkable and innovative vehicle available. Solectria unveils Sunrise at EVS-14, a description from a Solectria press release on Dec 2, 1994. Solectria's 1994 EV components catalog. showing their line of motors, controllers, and related products that were used in the Sunrise. Sunrise range records during the 1996 American Tour de Sol. 375 miles on a single charge! Test drive of a Solectria Sunrise by Michael Puttré of Design News magazine on June 23, 1997. 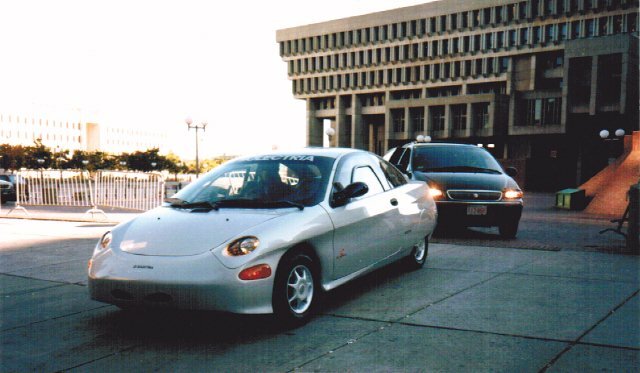 Boston-to-NYC Solectria press release from Oct 23, 1997 describing the Sunrise that made the record run from Boston to NYC at freeway speeds in regular traffic on a single charge. Boston to NYC article in the New York Times on the Sunrise's Boston to New York City run, with details on the trip itself, printed Oct 24, 1997. Our Sunrise Body being scanned by GKS Global Services, from an article on 8/18/10. "Charging Ahead" by Joe Sherman, (c) 1998, ISBN 0-19-509479-4. MPR interview with Lee Hart on the Sunrise EV2 project, Nov 10, 2009. The Sunrise in action on Youtube. Sunrise Crash Test video (sorry; not working right now). Solectria Sunrise page on Wikipedia. EV Album page on Steven Taylor's Solectria Sunrise. 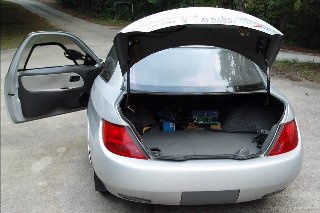 EV World article by Bill Moore on efforts to resurrect the Sunrise, from July 31, 2009. Sunrise Range Record remains unbroken, an EV World article by Bill Moore from Dec 6, 2009. The Solectria Sunrise development team; Spring 1998. From left to right: Steraen Hardy, Wayne Kirk, Alec Stevens, Guy Rossi, Mark Cardono, Jeff Fisher, John Rocters, Max Schenk, Gary Giammatteo, Ken Schia-Hughes, Clarke Taylor, Chris Anctil, and Vasilios Marcos (not visible; he took the photo). The Sunrise EV2 Project, © 2007-2014 by Lee A. Hart. Created: 2/6/2008. Last updated: 6/20/2014.